We'll explore eastern Cuba, Havana and rural western Cuba, giving you a sweeping perspective of this fascinating country and culture. Just 90 miles from the shores of Key West, no Caribbean island and few countries in the Western hemisphere evoke the wide range of emotion and curiosity that Cuba does for those of us in the United States. With a unique and turbulent history dating from it's discovery by Spanish explorers hundreds of years ago, present day Cuba represents one of the great socio-political experiments of our time. Despite almost continuous adversity, or perhaps because of it, Cuban culture can be vibrant and flamboyant as it struggles for a foothold in the twenty-first century or like a time-machine ride into the past. Our tour will give us a chance to explore both firsthand as we visit Havana for a look into city life and then venture into the diversity of Cuba beyond Havana, sampling Cienfuegos, Trinidad, Sancti Spiritus, Santa Clara, Varadero, Cardenas, Matanzas, Cojimar & Finales. This is Photozonetours second trip to Cuba. The first was such an amazing success we knew we had to return and expand our itinerary even further. Focused on a People-to-People theme, we will have unusual access to interact directly with Cubans from all walks of life allowing us to lift the veil that has shrouded the island thoughout most of modern history. Rich social documentary images will abound and photographers Layne Kennedy and Mark Alberhasky will be on hand to help craft your vision into powerful photographs. We will travel with an English speaking guide, professional Cuban photographers and a Friendly Planet Travel representative to ensure that your Cuban adventure is rewarding and enjoyable. Your unforgettable journey to Cuba begins today with an overnight stay in Miami, Florida. If you are arriving at Miami International Airport, complimentary hotel shuttle service to the Crowne Plaza is available every 20 minutes from any 2nd level departure terminal, simply hail the driver as they pass. This evening at 7:30 pm, participate in an introductory briefing to get acquainted with your fellow travelers and review your documents and program itinerary. You will be informed of the departure time of the group shuttle leaving the hotel tomorrow morning. This morning, transfer to the Miami International Airport to board your non-stop flight bound for Cienfuegos, Cuba. Bienvenidos a Cuba! You are welcomed by your private Cuban people-to-people representative holding a Friendly Planet sign outside the arrivals terminal at the Cienfuegos Airport. Board your air-conditioned coach, and jump right in as you head directly to your first destination in Cuba. Enjoy lunch at paladar Villa Lagarto. After lunch, continue on to the picturesque town of Sancti Spíritus, one of the original seven cities founded in Cuba by the Spanish five centuries ago, and home to Cuba's oldest church, the Parroquial Mayor. After checking into our hotel, you’ll have some time to rest and then the group will meet for dinner at a local restaurant or paladar. Accommodations: Hotel Plaza, Hotel del Rijo or Hotel Don Florencio. Lunch & dinner provided. After breakfast drive to Trinidad, one of the best preserved colonial cities in all of Latin America and a World Heritage Site since 1988 for its architectural and historical importance. For centuries a sugar production center, landowners gained enormous wealth, building stately mansions and centers of art and culture. Continue to the Casa del Alfarero, a pottery house that was founded and has been managed by the Santander Family for generations. Today you’ll learn the process of ceramic production and have the opportunity to create a piece of your own. Continue to one of Trinidad’s many “casas particulares” or bed and breakfasts where you’ll enjoy a tour and a discussion with the owners. Learn how bed and breakfasts are one of Cuba’s new entrepreneurial opportunities in a society where the state typically owns most enterprises. Ask questions and share insights about U.S. businesses, including the ever popular bed and breakfasts that are ubiquitous in the U.S.
Visit Templo de Yemaya where a Santeria Practitioner, along with some of the religion’s devotees, explain the basic principles of Santeria. On the way back to Sancti Spiritus, we’ll visit the Hacienda de Manaca Iznaga, located 20-25 minutes from Trinidad, in the heart of the Valley de los Ingenios, a series of valleys once known as a Cuba’s center for sugar production. Then, enjoy dinner on your own this evening. We recommend dining at a paladar. Feel free to choose one from the list we provided or ask your guides for alternative recommendations. Accommodations: Hotel Plaza, Hotel del Rijo or Hotel Don Florencio. Breakfast & lunch provided. Enjoy a special visit to the Santa Clara Music and Performing Arts School, with dance, theater and music performances by the students. Participate in a discussion with faculty and students about the role of music and education in the USA, and the impact of music on Cuban life and its importance in education in Cuba. Please note that this visit is only possible during the school year (September through early June). Should this school not be available, or in session, during your trip, an equally enjoyable and interesting visit to another community project will be substituted. Stop at the Che Guevarra Museum and Mausoleum, if time permits. Then, continue on to the beautiful Varadero Beach, 20km of white sand; our second destination in Cuba. After check-in, enjoy the resort town of Varadero and our beautiful, all-inclusive hotel at your leisure. Accommodations: Melia Varadero. Breakfast, lunch & dinner provided. After breakfast at the hotel this morning, we’ll depart for a visit to the Danzón’s Club in Varadero. Danzón is the official national dance and musical genre of Cuba. It originated in Matanzas and is practiced by hundreds of Cubans throughout the country. The clubs of “danzoneros” are dedicated to preserving the tradition and history of this dance. While visiting the Danzón’s Club you’ll have the opportunity to talk with its members (mostly elderly) about the history and characteristics of this dance. Of course, you’ll also have the distinct pleasure of joining the members while they dance to this traditional and lilting rhythm. Our next stop will be a visit to a unique Craft Workshop. Artisans, Mariela Alemán Orosco and Marilín Martínez Bárrio, a husband and wife team, are working magic with fabric and marquetry and have received prizes and recognition for their creative work. During the visit you’ll tour the workshop and experience the creative process as it is taking place. Then, we are off to the provincial town of Cardenas. Here we'll observe village life first hand, including the varied (and often quite creative) means of transportation residents rely on, like handmade bicycles and horse-drawn carriages. Our next stop will be at the Coincidencia Farm, founded by Héctor Correa in 1987. Senior Correa was an agriculturist with an interest in preserving certain native species of fruit that he knew and loved as a child. With a cart full of seedlings, he began to plant his farm. In order to multiply the effort, he created a seed bank so that any interested farmers could also cultivate the plants. In addition to farming, Correa created the first ceramics workshop in Matanzas, blending art with nature. Correa’s children have kept the family tradition alive by studying and working hard both on the farm and in the workshop. 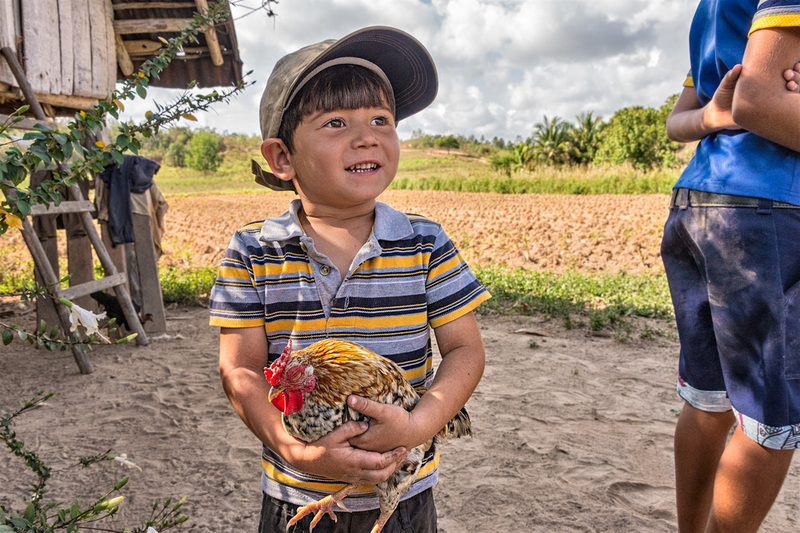 After touring the farm and ceramics workshop, we'll have the opportunity to engage in a discussion about opportunities for creative expression in farming and how the industry is important to both Cuba and the US. We’ll return to our hotel on time for lunch and enjoy the remainder of the day at leisure. Tonight, the group will have the dinner in one of the hotel’s specialty restaurants. Breakfast, lunch & dinner provided. 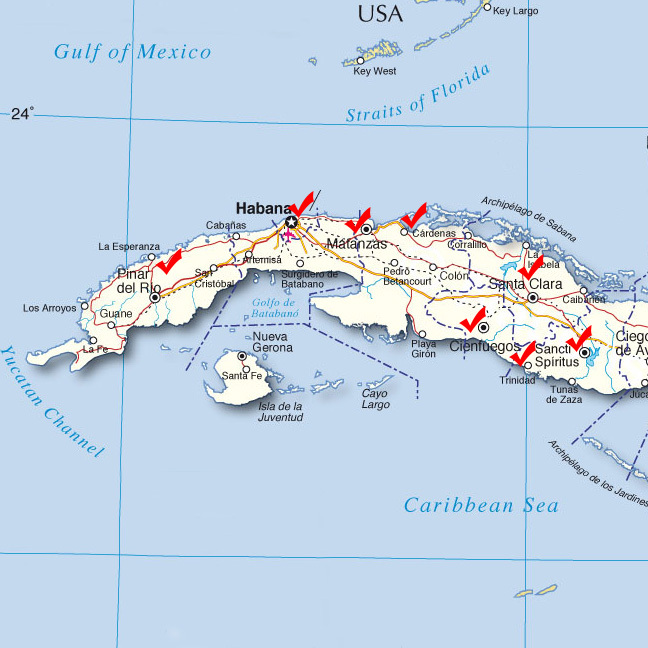 After breakfast, check out of our hotel in Varadero and drive to Havana. On the way, we'll stop at a community center in Matanzas to learn more about the Afro-Cuban culture and religion visiting the Callejón de las Tradiciones. We’ll drive through the district of Alamar on the outskirts of Havana, an expansive housing project started in the 1970’s. These Soviet-style pre-fabricated concrete apartment blocks four stories high are now home to hundreds of thousands of Cubans. Among the buildings in Alamar are community gardens, called Organoponicos, where residents grow fruit, vegetables and herbs for their own consumption and local sale. Similar to co-op and community gardens in the United States, these Organoponicos facilitate community development and offer Alamar’s residents access to fresh produce. Enjoy a visit to one of these Organoponicos, which few visitors to Cuba have the opportunity to do. We’ll continue on to the quaint fishing village of Cojimar, the setting for Hemingway’s book, The Old Man and the Sea, and enjoy lunch at a local, privately owned restaurant, called a paladar. Paladars are a classic example of Cuba’s recently revised policies allowing private enterprise to grow. After lunch, we’ll walk through the town. La Terraza Restaurant, where the character Santiago from the book, The Old Man and the Sea, brings in the remains of his epic fish, still stands today and the pier where Hemingway’s boat the Pilar, docked, can be seen from the shore. Proceed to Havana and check into the Hotel Meliá Cohiba. Accommodations: Melia Cohiba. Breakfast & lunch provided. This morning, we will walk through Old Havana to learn about its historic, architectural and cultural significance. The area was declared a World Heritage Site in 1982 by UNESCO. Learn about the City Historian’s massive efforts to restore Old Havana buildings, attract tourism and new investment, and improve social services for local residents. Then, we will explore the Used Booksellers Market, a cross-cultural treasure trove for readers of every genre. Meet local independent booksellers and engage in friendly conversation with Cuban readers about popular Cuban and American literature. Later, visit the Plaza de la Revolución, the most famous and politically important square in Cuba. The square has witnessed many rallies and revolutions that have altered the course of Cuban history, where you’ll view the 109m tall tower and an 18m statue of José Martí. Our last visit today is to "Fusterlandia", the home and surrounding neighborhood of "The Picasso of the Caribbean", Jose Fuster. Starting with a small wooden home as his canvas, Mr. Fuster has turned his dream into reality and transformed not just his own home but the entire neighborhood into a unique and colorful artistic landscape. Using the money he makes from selling his artwork, Jose adorns the community with sculptures and mosaics galore. After breakfast, we depart for Viñales. Full day photo tour with your specialist photographers! Lunch and dinner included. Accommodation: Los Jazmines. Breakfast, lunch & dinner provided. After breakfast, we depart for a three-hour leisurely walk in the valley. Our first stop is at Heraldo and Senora Clara’s turn-of-the-century farmhouse. 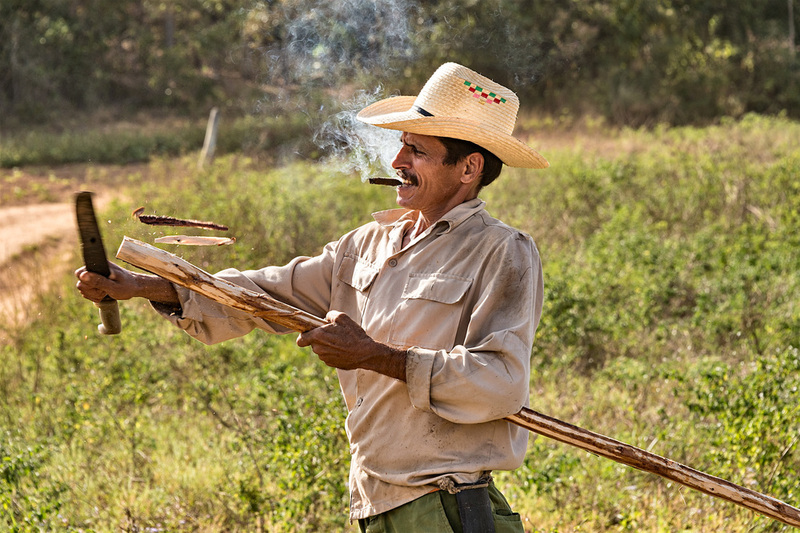 On our photo walking tour of the family’s farm, Heraldo will explain how tobacco is fermented in his traditional drying barn which rises to a thatched roof made from palm for ventilation. Senora Clara will graciously invite us for a cup of home-brewed café Cubana made from beans grown in her backyard and crushed using a wall-mount grinder. We proceed on an easy walk on a hard dirt path through the fields planted with pineapples or tobacco, past small hamlets and up into the mountain caves where slaves hid more than 500 years ago. Photo opportunities abound as we observe locals working the fields which are surrounded by “mogotes”. Lunch is served at a local restaurant in the valley. This afternoon we visit the charming town with its traditional one-story wood stores and houses with large porches which serves as social focal points for families in the community. Today, bid farewell to Cuba as you transfer directly from Vinales to Havana's Jose Marti International Airport and check-in for your charter flight back to Miami. Adios Cuba! • PASSPORTS are required for all US citizens traveling abroad and must be valid for at least 6 months after your date of return. Many countries will not allow you to enter their borders if you do not have at least 6 months of remaining validity on your present passport. If you already have a valid passport, please send Friendly Planet Travel two clear photocopies of the signature and photograph pages of your passport with your reservation. If you do not already have a passport, you should make arrangements to get one without delay and send the photocopies of the appropriate pages as soon as your passport arrives. Be sure to sign your new passport before you make your photocopies for us. Friendly Planet must receive your passport copy 60 days prior to departure in order to assure that your name appears on your ticket exactly as it appears on your passport. Airlines may apply penalties if it is necessary to make corrections to your name either in the air record or on your ticket. • VISAS U.S. passport holders must have a visa to enter Cuba in addition to a passport, valid for at least 6 months from date of travel. As authorized by the U.S. Government, Friendly Planet makes arrangements for all our passengers, regardless of nationality,* to have the visa issued by the charter airline at the airport upon check-in for your flight. NOTE: Your mother's maiden name is necessary for the Cuban Visa. *Only passengers who were born in Cuba cannot receive a visa through our efforts. If you were born in Cuba, you must apply for your visa directly. Please notify Friendly Planet at the time of your reservation if you were born in Cuba. TRANSFERS & TOURING are provided by modern, air-conditioned touring coaches. All entrance fees to places visited in the itinerary are included except those mentioned as optional. Arrangements for the itineraries, domestic transportation and flights are solely at the discretion of the local land operators and are subject to change without notice. If any changes are made, Friendly Planet has no liability. A deposit of $600 per person is required for each individual when placing reservations. INDIVIDUAL DEPOSITS ARE NON-REFUNDABLE ON ALL FRIENDLY PLANET TOURS.